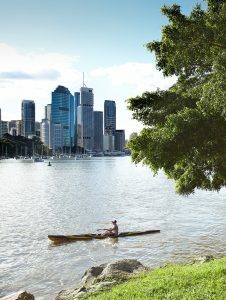 Water is Brisbane’s most precious natural resource and is central to the city’s identity and liveability. Water sustains life, underpins the economy and is integral to our enjoyment of the outdoors. As a coastal, subtropical city, Brisbane is defined by its river and Moreton Bay. The Brisbane River’s serpentine loops dictate the city’s form and its broad reaches bring the natural world right into the very heart of the CBD. The river’s banks and bay’s foreshores are our gathering places, the water our playground. This is the setting we choose when we meet, play and celebrate. The river is one of the city’s most important travel corridors and, together with Moreton Bay and the extensive network of creeks, gullies and wetlands, help cool our city, provide rich natural habitats, and are used for social and recreational needs. As tourism and economic assets, the bay, river and local waterways inject over $2.5 billion into the local economy each year. Floods and droughts have shaped our relationship with water. During the Millennium Drought (2001-2009) residents became enduring water savers. Following the 2011 flood, we made public infrastructure more flood-resilient and embraced flood-smart design in development. Brisbane is built on a floodplain but we know that good planning, clever construction and an engaged community can embed greater resilience into the city. Brisbane’s journey to become a WaterSmart city is outlined in Brisbane. Clean, Green, Sustainable 2017-2031, which documents the city’s sustainability journey so far, highlights key achievements and outlines future targets and commitments to drive us towards a cleaner, greener and more sustainable city. 87% of residents engage in water smart behaviour. 72% of residents actively prepare for flooding. In partnership with our neighbours and the Queensland Government, waterway health will improve for the lower Brisbane River catchment and Moreton Bay. Brisbane’s waterways will have improved native aquatic biodiversity. Adopt WaterSmart practices that contribute to a liveable, resilient city. Focus on ensuring our waterways, river and bay are healthy, safe and accessible. Design with water in mind. Empower community members to deliver sustainable water outcomes. Continue to be a water leader through knowledge and innovation. Waterway health, water supply and flood risk management and resilience have a significant regional dimension that requires Council to partner with other government agencies. In 2016, Brisbane City Council committed a total of $100 million over the next 20 years to the Oxley Creek Transformation Project. The project will revitalise a 15-kilometre corridor along Oxley Creek, from the Brisbane River to Larapinta, into a world class green corridor and leisure landmark. Oxley Creek is one of the major tributaries of the Brisbane River, flowing from the granite uplands of Mount Perry in the Scenic Rim and stretching 70 kilometres to its mouth at the Brisbane River. Once complete, the enhanced Oxley Creek corridor will have improved environmental values and offer lifestyle and leisure opportunities for the community to enjoy. The project will be delivered through public and private partnerships by the wholly Council-owned Oxley Creek Transformation Pty. Ltd, which will guide the 20-year vision to create a master-planned precinct with a revitalised green corridor, new economic hubs and world class recreation facilities. The project is currently in the initial planning stages, with a masterplan to be released for community input in early 2018. 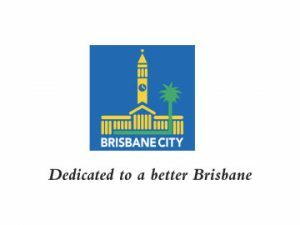 Brisbane City Council is a Founding Sponsor of the International Riversymposium.